What Is The Best Triathlete Training Workout? What is the best triathlete training workout? Our forum members have put together detailed ideas and workouts for just such an occasion. Learn who will benefit, types of results and more right here! TOPIC: What Is The Best Triathlete Training Workout? A triathlon consists of swimming, cycling and running. In order to compete, one must be multi-talented in the field of athletics. What is the best triathlete training workout? Be specific. What kind of results can one expect from this type of training? Who would benefit from this type of workout? Who would not benefit from this type of workout? Bonus Question: Do you use any form of a triathlete training regimen? To use your credit, e-mail Will @ will@bodybuilding.com for more info. The Best Triathlete Training Workout consists of swimming, cycling, and running. In order to compete, one must be multi-talented in the field of athletics. A Triathlon is a test of ENDURANCE both mentally and physically. And the only way to really excel at it would be to train for almost nothing but endurance. A triathlon training regimen revolves around developing your body's cardiovascular ability, as well as developing endurance fibers in your muscles. You have to train for each phase of the triathlon individually, but also learn how to handle all three at once. Learning efficiency will not only save you a little bit of time but it will keep you from exhaustion before it is time. For the swimming leg of the triathlon, it is important to develop good technique first and foremost. By practicing with poor technique and form you will only instill those habits into your muscle memory and perform poorly on game day. So start out by taking it slow and working just on form. [ Click here to learn more. ] Triathlon Swimming Techniques! As one of the most popular events of current times much more research is being done to see what areas of performance can be improved upon. The most common stroke is the front crawl/freestyle stroke, and that is because when done correctly, it is an efficient stroke that allows people to keep going practically forever. A good video on freestyle form can be found here. Keep in mind that your legs are typically big muscles and use a lot of oxygen without providing an appreciable amount of forward thrust, so it would be wise to learn your own body's balance for leg work in freestyle. After you are done perfecting your stroke, it is time to start training in the water. Knowing what length of triathlon you will be competing in will be key here. Some triathlons can have a swimming phase of a few hundred meters, while some will be more than two miles. So knowing what you're training for will dictate how you will train, so that is key. Click Here For A Printable Log Of An Example Swimming Workout. Your technique should be a strong focus during the entire routine, but be especially mindful when you are going slow after a sprint and you should be tired. In between sprints, or just during the slower legs, you can put on paddles on your hands, or use a kickboard to focus on your stroke strength/technique or kick technique. As time progresses, you can lengthen the distances of your sprints. An alternative workout would be one designed for sheer distance swimming at a relatively non-competitive pace. And that is simply just get in the water and start swimming, focusing on form and take short rests every now and then to hydrate, but keep moving. [ Click here to learn more. ] The Importance Of Proper Hydration. Many people underestimate the importance of water. Many people think it is just a mom's tale, like you need to drink your milk. You could not be farther from the truth! The cycling portion of the triathlon can be a relief if you are moving as efficiently as possible. Once again, just like your form while swimming, cycling correctly can save you extreme amounts of energy as well as speed you up. Again, depending on the lengths of your triathlon, you will need to adjust your training. The main thing when it comes to cycling is climatizing your body to something different. If you've never cycled an appreciable distance before, you've probably never experienced horrible soreness in your rear end. It does not feel good. So start out small with 10-mile rides and work your way up. Depending On The Length Of Your Triathlon. Another key here is to involve sprints in your riding. Cycling at a fast cardio-intensive pace for 10 miles is difficult, so sprints will allow your heart to get some serious action while also teaching your muscles how to cycle oxygen at a faster pace to recover. So a typical 50-mile bike ride during training might involve a few miles of casual pace warm-up, followed by a riding pace where you are tucked in (to reduce air resistance) and peddling at a consistent cadence. Once you're in your "groove" and you feel like a machine, pull out a 1-minute sprint at about 85-95% effort. When this is done, return to your prior pace for 5 minutes or so, and then pull out another sprint. Continue this until there are about 10 miles left. Then, depending on how you feel, continue for another 5 miles, or just relax and begin a gradual cool down. [ Click here to learn more. ] The Cool Down. Although the warm up and cool down are both important, they are important for different reasons. While the warmup prepares the body for strenuous activity, cooling down plays a different role. It is best to not risk overexerting yourself on long rides, because if you overestimate your abilities and you're still 25 miles out from your destination when your body begins to shut down, you're in trouble. And again, proper form will not only help you avoid injuries, but will save you from early exhaustion. There are many approaches to running from all kinds of experienced people, but it is important to not try to mimic something that doesn't feel natural to you. Running should be a smooth motion throughout your entire body, and should feel natural. If something feels a little off while you run, you probably need to reevaluate your running form. Shorter triathlons can be just a few miles. Some can be as long as marathons (26.2 miles). And I'll repeat myself again: know what you're training for. Aside from competitive marathoners, most marathoners run at a slow steady pace. If you train for longer distances, it will be important to train your body to be able to run these longer distances initially. I recommend focusing on long runs at a comfortable pace, that is still hard, but it doesn't make your heart beat like a jackhammer. As your body and you adjust to this and learn how to run for long distances you can start shifting to other types of cardio. There are three basic types of runs that your training should generally revolve around. They are sprints, tempo runs and distance runs. Sprints are pretty self explanatory. Basically, pick a distance and run it as fast as you can, resting a little, and then run back. Tempo runs are probably the hardest thing to do. Push yourself at a fast pace (85-90% effort) for a medium distance run of probably about 3-to-5 miles, maybe a little longer for the more advanced runners. Distance runs, as discussed earlier, teach your body how to last a long time in the heat, teach your feet how to ignore swelling associated with long runs, and basically teach you how to keep moving. Distance runs are probably 6-to-16 miles in length. A good running program will revolve around these three runs. Click Here For A Printable Log Of This Example Sprint Workout 1. Click Here For A Printable Log Of This Example Sprint Workout 2. Click Here For A Printable Log Of This Example Sprint Workout 3. Sprints should pretty much crap you out, because if you did them right, your body is going to be begging you for oxygen and you will be breathing like no other. A good way to mix sprints with tempo runs is sprinting from one light pole to the next, and jogging at a fast pace between the next two, and repeating. Indian runs are also good if you run in a group. These involve running in a long line, and the person in the back will sprint to the front of the line and set the pace of the line when he gets there. As soon as he reaches the front, the next person at the back of the line will sprint to the front, and so on and so forth. It is important to maintain some time in the gym lifting, but heavy weight training will not help you, and in fact will probably hinder you. It would be best if you focus on lighter weights and higher repetitions while in the gym. What typically works best for me: I focus primarily on body weight calisthenics 2-3 times a week, and use free weights to hit the shoulders, traps and other muscles that are hard to hit, doing mostly just a push/pull/sit workout. Now that you know how to train for each component of a triathlon, it is time to combine that training together. You can't train every day without risking injury, and you can't train for just running one week and then just swimming the next. It has to be a balanced program, with a little more emphasis going toward your weakest aspect. Typically, you should plan on training 4-to-5 days per week. Alternate training between the three different components, and then one day just combine it all together. Ride your bike over to your swimming pool or get someone to drop you off with your bike. Swim, but don't focus all your energy into it. When you feel you've accomplished a reasonable distance proportional to your triathlon, hop out and get changed and get ready to ride. This will also be a good opportunity to practice your transitions between phases because that time will usually count against you too. Hop on your bike and go. [ Click here to learn more. ] Marathon & Triathlon Training! This is a safe and effective introduction to running and endurance sports. The article will give general guidelines and also touch on injury prevention. Don't worry about doing sprints right now, although you can if you want. Focus more on maintaining a fast and steady pace, and learning how to pace yourself, and what you pacing limits are. When you reach your destination point, lock up your bike, or give it to someone you know and start running. Or if you have to transition out of your special cycling shoes (should you have them) do so and get moving. You should start feeling worn out right now, but that's no excuse to quit or cut your training short. Keep going, because you're almost finished. When you reach your destination, just relax and hope you're either close to home, or have someone to take you there. It will be important to cut down the intensity and frequency of training every few weeks to ensure your body is adequately recovering and you are not overtraining and wearing yourself down. As with the entire course of your training, make sure you hydrate plenty, even when swimming. Macronutrient ratios need to move away from a diet high in protein and one more toward one extremely high in carbohydrates. Protein will still be extremely important, but you need to make sure you aren't getting your body weight in it, because that will only grog you down, especially if it comes from heavy meats. Whey protein is a good source of protein during the day. Casein protein would be great during the night to give your body plenty of what it needs to repair muscles overnight, along with a good multivitamin, and maybe some calcium supplements to help repair your bones from all the jarring of running. Other supplements that may help with the mental and physical effort would be amino acid beta alanine, as well as a BCAA supplement like Xtend. But by far, the most important thing is to keep yourself hydrated and eat healthy meals limited on simple sugars and saturated fats. Xtend is a precise, scientific blend of Energy Aminos consisting of the proven 2:1:1 ratio of Branched Chain Amino Acids (L-Leucine, L-Isoleucine and L-Valine), Glutamine, Citrulline Malate, and Vitamin B6 that will give you the energy you need to maximize your training while enhancing recovery at the same time. Through triathlon training you will notice that you will probably lose a substantial amount of fat if you monitor what you eat and eat clean. Although the biggest noticeable difference will be in how you feel during the day. You will notice that you have much more stamina during the day and it takes more to get you stressed out because your body can just withstand more and has become much more efficient. If you pick up strength training after increasing your endurance in the manner above, you will notice that you don't get tired as quickly when lifting. You might not be able to squeeze out that last rep, no matter how hard you try, but when you get up, your muscles won't spasm, because they've become markedly more efficient and have already started replenishing oxygen and energy back into your muscles. Anyone who is generally under a lot of pressure, or is at risk for health problems can probably benefit from a training regimen like this, or similar to it. You don't necessarily need to train for a triathlon to experience the benefits of triathlon training. If you only picked one aspect of this training to add to your current routine, I recommend the running program. A large chunk of Americans are at risk for several serious health problems. I believe most people can benefit from the running program detailed above. The only people I can imagine who would not benefit from the above training would be people with a condition that makes it dangerous for them to do it(powerlifters or pure bodybuilders). Powerlifters can't afford to train anything but strength, and while amateur bodybuilders can probably afford some time off from training to increase overall fitness, competitive bodybuilders will probably not be able to risk losing too much gym time. As part of a cutting program, this training regimen can be modified to not be so strenuous for bodybuilders. Do You Use Any Form Of A Triathlete Training Regimen? While never having done a complete triathlon myself, I have competed in long distance runs, done endurance swimming and participated in amateur bicycling tours. So I have incorporated all of the above aspects individually into my training at one point or another. Currently I'm focusing on running and calisthenics, with a small push toward developing my swimming abilities further. I use the above running program, as well as the above swimming program (except I do more strokes) and have noticed great improvements. A triathlon consists of swimming, cycling, and running. In order to compete, one must be multi-talented in the field of athletics. Many people who are good at swimming or cycling or running think they can be successful at a triathlon. This is often not the case. The grueling combination of swimming, cycling and running placed one event right after the other is what makes triathlons so difficult. The International Triathlon Union (ITU) regulates the distances that are acceptable for official triathlons. Triathlons are split up into different categories based on distance and age. Here's a table detailing the approved ITU distances (+ / - 5%) for triathlon categories. A triathlon begins when all the competitors enter the water when the announcer gives the signal. The competitors swim until they reach the next part of the race - the cycling. They quickly get out of the water and change into their cycling gear in the transition area. After cycling, the triathletes reach the final transition area where they change into their running gear and finish off the race. Some of the more well-known triathlon events include the Hawaii Ironman Championship, the Nice Triathlon in France, and the Escape from Alcatraz in California. Triathlons take a lot of mental strength and willpower more than anything. The races are taxing on the mind and body. [ Click here to learn more. ] How To Ride Your First Triathlon. Knowing your body and accepting its limitations are the key to a solid, consistent bike leg of a triathlon. Triathletes need to utilize three different modes of training to succeed - running, cycling, and swimming. The triathlon is primarily an endurance event, although training should be slightly different depending on the actual triathlon and distances. To start, all competitive triathletes should have a basic level of fitness. If these parameters are not met, then the following General Physical Preparation (GPP) program should be employed. Click Here For A Printable Log Of TUnit's Weeks 1-8 Monday Workout. Click Here For A Printable Log Of TUnit's Weeks 1-8 Tuesday Workout. Click Here For A Printable Log Of TUnit's Weeks 1-8 Wednesday Workout. Click Here For A Printable Log Of TUnit's Weeks 1-8 Thursday Workout. Click Here For A Printable Log Of TUnit's Weeks 1-8 Friday Workout. Sunday should be timed and improved upon each week until desired time is reached. Click Here For A Printable Log Of TUnit's Weeks 1-6 Monday Workout. Click Here For A Printable Log Of TUnit's Weeks 1-6 Tuesday Workout. Click Here For A Printable Log Of TUnit's Weeks 1-6 Wednesday Workout. Click Here For A Printable Log Of TUnit's Weeks 1-6 Thursday Workout. Click Here For A Printable Log Of TUnit's Weeks 1-6 Friday Workout. Click Here For A Printable Log Of TUnit's Weeks 1-6 Saturday Workout. Click Here For A Printable Log Of TUnit's Weeks 1-6 Sunday Workout. Eventually, you will be ready to compete and do well in triathlons. This type of training can be employed as GPP and also as seasonal training. It works as a General conditioning tool for those who have not trained for triathlons yet and also works as a specific training program for more advanced triathletes. One can expect phenomenal gains in endurance from this type of training. Strength and size are not necessarily the goals here, but may be experienced as part of the weight training regimen outlined above, provided diet is on point. Endurance increases in running, swimming and cycling will be made which will help the athlete to perform better at various distances in each respective event. Anyone looking for endurance gains would benefit greatly from a workout like this. Also, those training for triathlons would surely benefit from the workout. These workouts are challenging and require a basic level of conditioning before starting them. Marathon runners, swimmers and cyclists would all benefit from these workouts. It is simple to just take one part out of the program to cater it to the needs of the athlete. For example, a cyclist could replace the swimming and running days with medium intensity cycling. A marathoner could run on 4-or-5 days of the week and lift weights only twice per week, utilizing the same principles outlined in the program. It is diverse in its application, rendering it effective for athletes with different goals. Bodybuilders, strength athletes, sprinters and all athletes involved in sports that involve power and explosiveness would not benefit from these workouts. These workouts primarily train the Type I muscle fibers - the slow twitch. These fibers are responsible for endurance. Athletes in sports such as football, basketball, or sprinting need to have as many Type II (Fast Twitch) muscle fibers as possible to be able to perform well at their given sport. This should be of interest to bodybuilders as well. The fast twitch fibers have the most potential for growth. [ Click here to learn more. ] Understanding Muscle Fiber Types. This article will deal mainly with how people think the muscle type makes no difference, how muscle type is over-rated and how it gets more credit than it deserves. At the moment, I do not use triathlon training workouts but I plan on trying such workouts in the future when I am in my 30s and 40s to maintain an excellent level of conditioning. 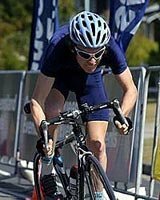 I enjoy swimming, cycling and running in my free time but at the moment I am a competitive basketball player who utilizes bodybuilding techniques throughout training, so the triathlon workouts would be counterproductive to my goals at this time. However, it will be helpful to train like this in the future. I want to be physically active for as long as I can and training this way will certainly help me achieve that goal. I may even enter in a triathlon one day if I feel I can compete and possibly win. "So I officially signed up for my first triathlon (olympic) and am starting to train ... I am doing this because it's something I've always wanted to complete. My goal is to complete it (I am not doing it competitively)"
"I am wanting to start training to become a triathlete. I don't know where to begin, but I am trying to keep up a weekly routine so I can do a half-tri in January." "I set a goal for July of '09 to enter in a triathlon. I was just wondering if anyone has good ideas for supp's for endurance and something to get more oxygen to my blood! Please help." Triathlons demand impeccable cardiovascular conditioning as well as the mental drive to propel oneself past the finish line. Training for a triathlon involves an event-specific regimen heavily centered on aerobic exercise. Marathon runners and triathletes (usually) are not muscular in appearance but lean and agile. One cannot just dive into a triathlete training workout, one must first know how to execute the exercises properly. Translation: Learn correct running, cycling and swimming technique. Similar to weight/resistance training, strict form will prevent injury while maximizing gains. Although unnecessary, upgrading to specialized training equipment will make running, cycling and swimming more comfortable and efficient. Obviously it would be impossible to dive right into a full Ironman without any background experience. This plan helps develop a base to build off in the future. Alternate between the 3 events (swim/cycle/run) but focus on one's weakness(es). Example: Swimming will most likely be the hardest segment of the challenge for the majority of the competitors. In this case, dedicate an extra day to swimming training. Aim to complete a fraction of the actual race length each training session and increase the distance based on personal progression. Set goals such as continuously running 1 km and then work off that. If the desired distance cannot be achieved running in one effort, walk until one is capable of running again. Try to cut down on walking and maximize running each workout. (Apply this same principle to cycling and swimming - a pool is recommended because of the dangers of swimming away from shore). Train to finish, focus on the clock later on. The workout is performed in intervals based on the actual distance which must be covered. I believe that one should surpass the contest distance in training to ensure that one will not fall short. If the competition distance was 2 km, I would recommend 3-4 intervals of 500-750m minimizing the amount of rest time in between. Consider using pre-exhaustion training where one runs a set distance, rests/decreases the intensity for a short while, and then runs the competition distance mimicking triathlon conditions. Once again, train for endurance at first and speed later. Detailed plans can be found here. A few of the results attributed to this type of training include increased cardiovascular conditioning, body fat loss, heightened oxygen utilization, improved V02 max, finely tuned stamina, lower resting heart rate, a strong healthy heart, and greater general health. These results could be capitalized when paired with a structured diet of high carbohydrates, moderate-high protein, and a moderate source of healthy fats. Those who would benefit from this type of workout include anybody seeking the above results, from average couch potatoes to future triathletes. Everyone can benefit from increased endurance and a healthier heart. I recommend the beginner walk and run workout to those new to exercise or seeking fat loss. [ Click here to learn more. ] Give Yourself A Healthy Heart. We all know that exercise is crucial for the heart. It is important but let's not forget about some of the nutrients that we must include for optimum health. Anybody with pre-existing medical conditions that impair, prevent or predispose one to an injury should not engage in this type of workout which the body may be placed underneath. This form of training could be extremely detrimental to those with certain health problems. I use a form of a triathlete program in the sense that I participate in endurance training. I believe that cardiovascular training is a necessity which is often overlooked in the modern dumbbell and barbell world. I incorporate long distance running/cycling/rowing to maintain a high level of fitness as well as increased blood flow which further allows nutrient uptake. Currently my goals pertain to gaining muscle, however I would like to compete in a triathlon within the next few years.